Despite the scores of cookbooks, magazines and websites devoted to recipes, when it comes down to it, the food we eat at Christmas is all pretty much the same. Turkey, ham, seafood; salads or baked vegetables. Followed by pudding, trifle and/or pavlova. Maybe a barbecue or a picnic. We tweak the recipes or stick to the tried and true; but viewed pragmatically there isn’t a great deal of variety from home to home and from year to year. Sharing food at Christmas is far less about the food served than the memories and ritual attached to it. Until relatively recently Australians continued to recall “home” – the land their forebears had come from – by serving heavy, hot meals totally inappropriate for the Antipodean summer, even if they had never travelled outside Australia. When we were invited to Boxing Day lunch at a neighbour’s home, we didn’t expect anything different. We were greeted with nuts, cheeses and nibbles, moved on to turkey, ham and chicken with potatoes and salads. Followed by Christmas pudding and pavlova. All delicious and accompanied by good wine and good conversation, but it was similar to what we’d eaten the day before. Then something unexpected appeared; a plate of home-made meringues, tinted pale green and topped with Hundreds-and-Thousands. Immediately I recalled the meringues my mother used to make. Identical in appearance except for the colour – hers were white or coloured pale pink with cochineal. I babbled incoherently about memories of my mother, about the sweet, sticky meringue bringing tears to my eye. The woman who had made the meringues wasn’t even there. I hope they told her how much pleasure they gave not only me, but also our daughter who tasted them and the others who saw the photos. Poor Ron, for whom the meringues were intended, didn’t get a look in as the left-overs were pressed upon me. My unexpected experience reminded me that much food is more than sustenance. It is loaded with memories and emotion. These days meals are routinely recorded on Instagram, but it is the rituals associated with food that give it meaning. In our family we have “Christmas ham” and “Jeannie’s potato salad” (as well as the meringues). My mother’s hand-written, butter-stained cookbook includes recipes for “Joan’s Christmas pudding”, “Buzz’s biscuits” and “Henny’s scones”. 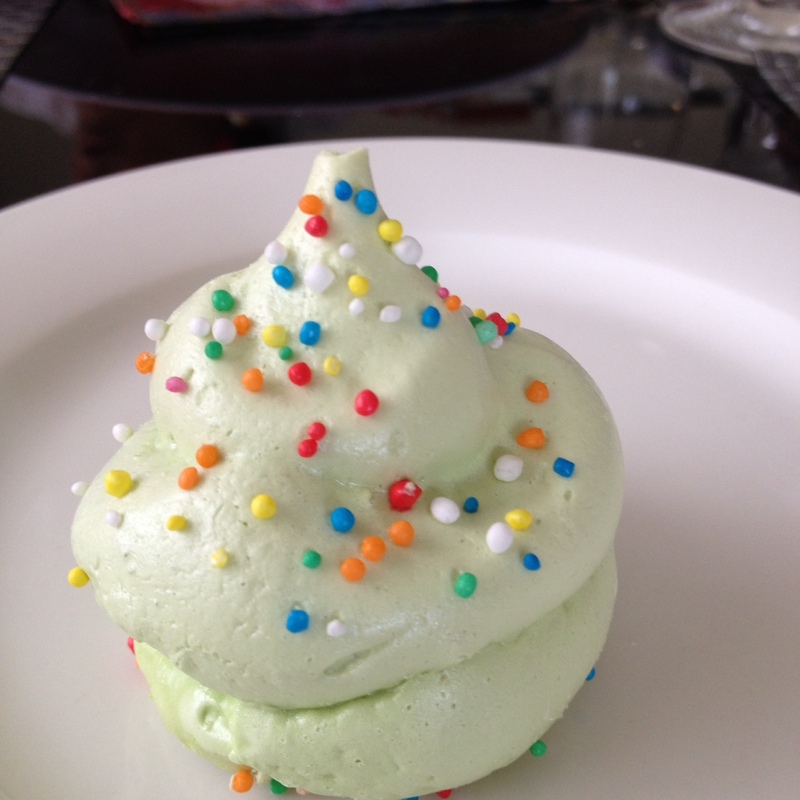 I still cook some of these; others are only recalled when something unexpected happens – like the appearance of the green meringues. Christmas food triggers memories of happy Christmases and sad Christmases; of relatives who got drunk and relatives who fought; games of cricket in the backyard and post-prandial naps. However many recipes we read, however we fuss about dressings and desserts, table settings and bon-bons, what we are really trying to do is to recreate memories of childhood, family and friendship. The difference between my Christmases and yours is not the glaze on the ham or the dressing on the salad, but the memories they recall and recreate. This year the green meringues, shared with neighbours and strangers, were my unexpected Christmas memory. Yes food and memories are inextricably linked. Thank you for your comments.